PARCEL 1- BEAUTIFUL HOME AND BUILDINGS ON 94 ACRES Parcel codes: 25-002-00100 and 25-002-14000. PARCEL 2- 94+ ACRES BUILDABLE OR RECREATIONAL LAND Parcel codes: 25-002-00200, and 25-002-13000. PARCEL 3- 134+/- ACRES BUILDABLE OR RECREATIONAL LAND Parcel codes: 25-002- 00300, 25-002-24000, and 25-002-23000. Legal Description: Koochiching County, Section 2, Twp 67, Range 25. Approx. 322 acres. TERMS: 10% down on the day of auction, the balance due in 45 days, subject to seller’s confirmation. Questions? Contact Carol Reinhardt, Broker at 218-845-2260. 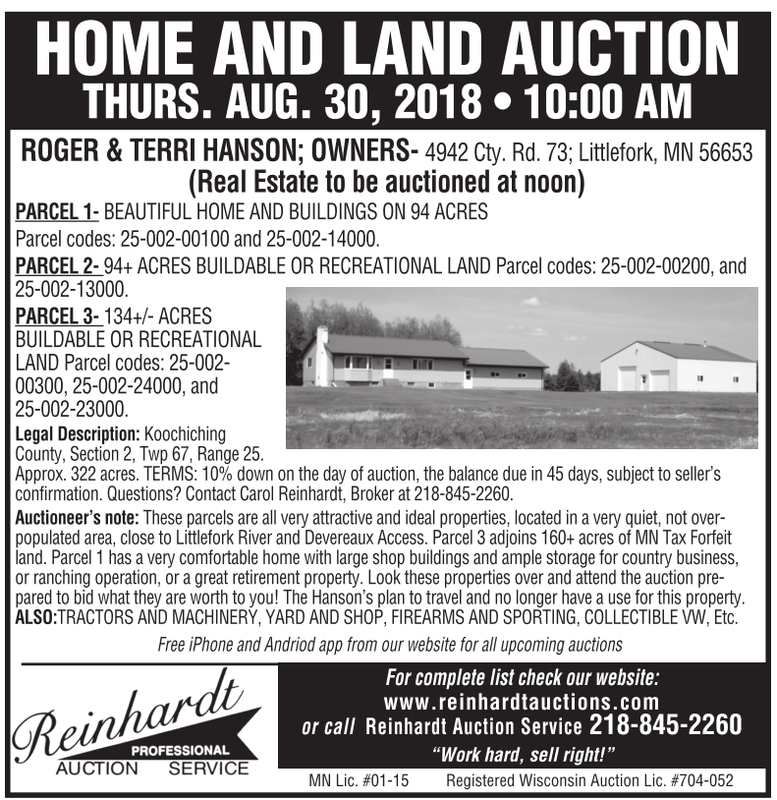 Auctioneer’s note: These parcels are all very attractive and ideal properties, located in a very quiet, not overpopulated area, close to Littlefork River and Devereaux Access. Parcel 3 adjoins 160+ acres of MN Tax Forfeit land. Parcel 1 has a very comfortable home with large shop buildings and ample storage for country business, or ranching operation, or a great retirement property. Look these properties over and attend the auction prepared to bid what they are worth to you! The Hanson’s plan to travel and no longer have a use for this property. ALSO:TRACTORS AND MACHINERY, YARD AND SHOP, FIREARMS AND SPORTING, COLLECTIBLE VW, Etc.